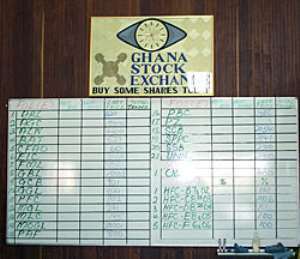 Accra, Nov. 16, GNA - The Accra bourse ended sideways on Tuesday with the main indices remaining unchanged in dull trading. The GSE All-Share Index remained at 6,893.18 points and there was no price change in any of the equities. Change for the year was flat at 93.99 per cent. Market capitalization was also unchanged 97,236.03 billion cedis from 3,580.79 million issued shares. Total shares traded slumped at 35,700 from 171,700 shares last Friday.